E.P. Severns, Jr., president of Coca-Cola Bottling Company of Kokomo, draws Western in the first position of the Old School Kokomo Sectional Tournament. On Monday, approximately 100 players coaches, administrators and fans ate dinner at Whiskey Creek and watched as E.P. 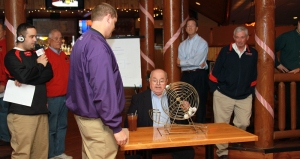 Severns, Jr. conducted the first-ever blind draw for the Inaugural Old School Sectional boys basketball tournament presented by the Coca-Cola Bottling Company of Kokomo. Players and coaches from Eastern, Northwestern, Taylor, Western and Maconaquah have been on edge for months, wondering if they would draw mighty No. 3-ranked Kokomo in the first round, or perhaps have a shot at the upset in the championship game. As the draw commenced, Severns drew Western out first, followed quickly by Eastern to complete the first match-up of the tourney. Taylor was drawn third and will face Northwestern in game two on the first night. That left Maconaquah and Kokomo to battle in the bye round on the second night of the tourney. So when the draw was done, for a Howard County team to meet the Kats, they will have to be the king of the county and hope Kokomo beats the Braves. For those who are not familiar with this new event, Eastern, Taylor, Northwestern and Western will forgo the 2012 Howard County Boys Basketball Tournament and will join Maconaquah and Kokomo in the seven-game event to be played over the Christmas holiday season. These six schools competed in the Kokomo Sectional during the late 1960s and mid-1970s, and again from 1985 until class tournament play began in 1998. Kokomo’s historic Memorial Gymnasium will serve as the host facility, with the first two games being played on Dec. 23, starting at 6 p.m. The second night of games will consist of three contests on Dec. 27, beginning at 4 p.m. The championship and consolation games will start at 6 p.m. on Dec. 28. Severns, president of the local Coca-Cola Bottling Company, said he and his employees were honored to play a part in the historic event. Tournament ticket books for all seven games are on sale at all participating schools, priced at $12. Single session tickets priced at $6 will be sold at Memorial Gymnasium on game nights. All-sports tickets will not be in use for the tournament. For more information, contact any participating local athletic office. This entry was posted in Balentine, Eastern, High School, IHSAA, Kokomo, Northwestern, Old School Sectional Tournament, Sectionals, Tournament, Western, Wildkats. Bookmark the permalink.